Successfully Added 4 Camera Surveillance System - 4 Outdoor CCTV Cameras, H264 DVR, 500GB to your Shopping Cart. 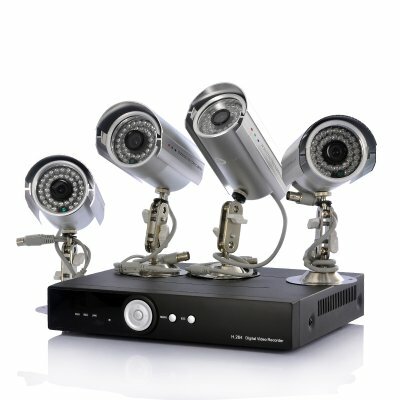 Security Camera set with 4 CCTV Outdoor cameras, a DVR with 500GB HDD and all the cables you need to easily set up your own CCTV surveillance network. Setting up your own security camera network is not always easy. Knowing if the cameras will work with your DVR is difficult and there is not always a way to find out before you buy. 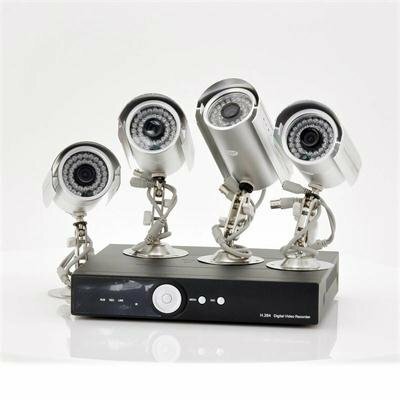 But with this CCTV surveillance set, everything you need to set up a professional camera network is included; 4 High quality outdoor cameras, a DVR with a 500GB SATA Hard Drive and all the connection cables are provided. And best of all, the installation can be done in just a few hours and without much technical knowledge. To offers the best video quality possible while maintaining a small file size, the DVR uses H.264 compression technology and stores the files away on the 500GB Hard Drive. Up to one week of footage can be stored and the Hard Drive can even be extended up to 2TB! On top of that, the DVR can be connected to the internet for instant remote access, wherever you are. 4 Outdoor CCTV Cameras with night vision are also provided. The 36 IR LEDs turn on automatically in low light conditions and give up to 30 meter viewing distance in the darkness. Thanks to the 1/3 Inch Sony CCD sensors, not a single person will go past these cameras unnoticed! If purchased separately the contents of this kit would easily approach $1000. Save almost 70% by purchasing this kit and you can rest assured that everything is compatible right out of the box! This easy to use and easy to install CCTV Set is now available from Chinavasion, the leader in wholesale CCTV camera and DVR sets. Language: Chinese, English, Portuguese, Spain, Turkey, French, German, Italian, Russian, Thailand, Poland, Hebrew menu languages.